Bowser is trying to take over the Dream Depot with his team of Koopa Kids. Mario and his friends dive to help and save the world of dreams. Each player rolls a dice on the board. 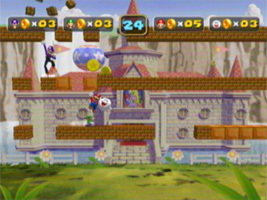 Once all four players have rolled, they are split into teams and have to play a minigame to win Coins. You can spend Coins on Capsule items to improve your chances or affect your opponents, or to buy Stars off Toad. The player with the most Stars at the end of all the turns is the winner. You can also land on Bowser or Donkey Kong spaces to start minigames, or trigger board events by landing on special spaces.